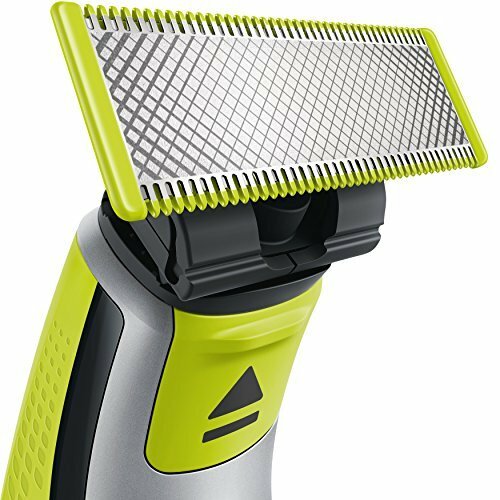 I guess that you may be a bit perplexed at seeing a review for Philips OneBlade a product that is for shaving, but many guys keep their cheeks and neckline clean and so I guess we can allow that! The first thing I noticed when opening the box is the lack of instructions, just a little square of paper that has six pictures that supposedly tell you how to use the OneBlade. The one useful bit of information on this piece of paper is a web address which leads to their website that instantly tries to sell you more blades. Once you scroll past the sales pitch you see some instructional videos that reveal the reality of the TV advert, but are still more descriptive than the little piece of paper. The next thing that struck me was the promise of 45 minutes of shaving per charge, this will be great for shaving my head so I’ll give that a go also, when originally looking into buying the OneBlade I was expecting it to be battery operated so it came as a pleasant surprise to have a two pin charging cable drop into my lap as I opened the box, along with three “stubble guards” (1mm, 3mm and 5mm). I played with the Philips OneBlade for a few minutes while trying to work up the courage to “style” my beloved beard. This lead me to check out how to remove the blade, expecting it to be like many other razors I’ve tried, thinking the blade would come away from the mount. Unexpectedly when I pressed the eject button under the blade, the whole thing shot off across the room. When I stopped laughing, it was nice to see how easily the mount and blade slotted easily back onto OneBlade. I think the fact that the Philips OneBlade blade is easy to replace, attached to the mount and that it has a life expectancy of four months justifies the cost of the replacements (£11.99 for one or £19.99 for two). I think the main selling point for these blades has been greatly understated. All razors, except cut-t, have the same problem over and over again, they all become easily clogged with hair and these blades have nowhere for the hair to become trapped making it easy to rinse or wipe clean. For the purpose of this review I decided to shave in stages: using stubble guards first on one side of my face, then used an open blade on the other side, then edge my tash and finally go for a whole look using all different methods. Shockingly when using this razor I never once experienced any “pulling” making it a more enjoyable experience. The stubble guard was the most impressive part of the shave leaving a near uniform stubble and nice feeling compared to any other stubble blade I’ve tried. Next fell a large patch of beard to the might of the open blade, it disappeared with ease, but was nowhere near as close as the advert would have you believe. When it came to edging I was totally unimpressed, I think I could have done just as well with the stubble guard. Finally the overall shave looked good but was not as close as I would like so I won’t be throwing away my disposables yet. In conclusion: although it’s not as wonderful as advertised, not as clean as a visit to the barber’s shop (you can’t see it but you can feel it when you run your hand over it), it’s a great tool for styling but probably shouldn’t be used for everyday shaving; as for my head… it wasn’t as fast as my clippers but all my moles are intact. Great review Zechariah! I’ve also just posted a review, a few weeks in and I’m still really pleased with it. Haven’t had to charge it yet! Thanks, it was a guest review from a guy called Derek Alderson.